The goal of OCBC Bank’s Digital Media System is to create an atmosphere. Few people think of banking as fun, but informative and entertaining signage can create an atmosphere that is inviting, relaxing and engaging. If that atmosphere exists, then customers will have positive mental associations with the bank because of the signage and be encouraged to continue banking with that institution. 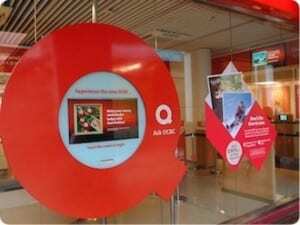 Installing a digital multimedia systems network offers a number of benefits to OCBC, including better engagement with the customer, increased opportunity for targeted promotions and messaging, and improved corporate communications.